CEO Mary Barra's name appears on just one of the documents made public Friday, but GM says the email is unrelated to the ignition switch recall. The House committee investigating GM's botched recall publicly released 250,000 pages of related documents Friday, including internal emails discussing investigations of the Cobalt, Ion and other recalled vehicles. 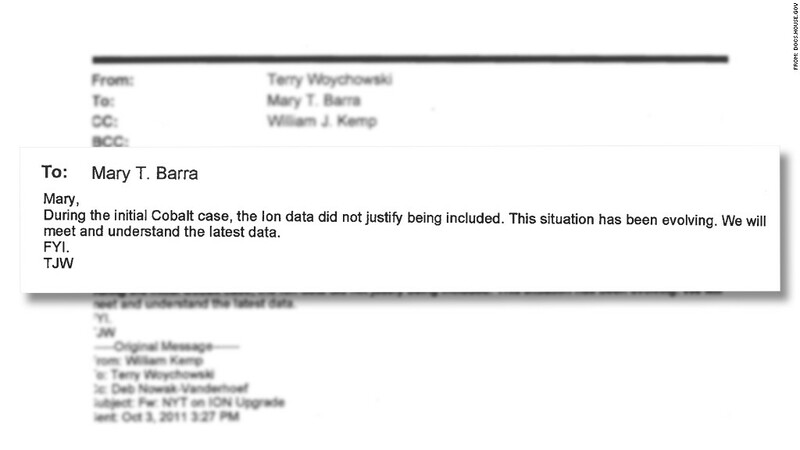 Just one email released by the committee has GM CEO, Mary Barra's name on it. It discusses steering problems in Cobalts and Ions and was sent to her in 2011, before she became CEO. The email didn't mention the ignition switch problem that sparked this year's massive recalls. 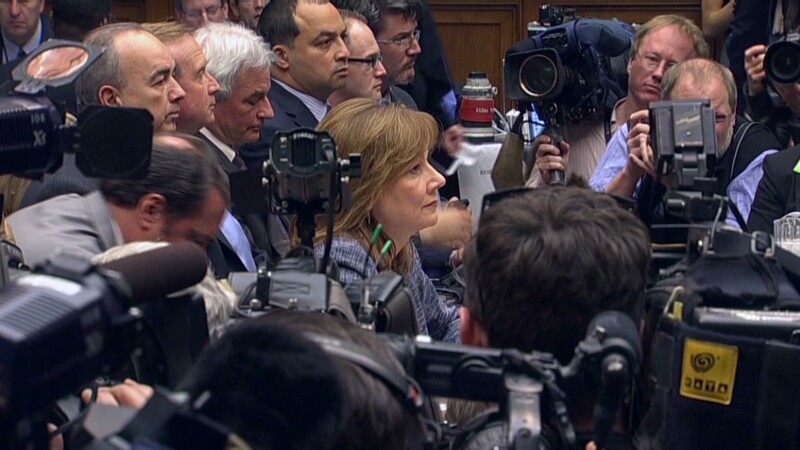 Barra testified that she did not know the issue was even being investigated within GM until December of 2013. The recall was first ordered on January 31. GM spokesman Alan Adler told CNNMoney Friday that the email has nothing to do with the ignition switch recall and "in no way contradicts Ms. Barra's previous statements." The committee requested the documents as it tries to find out why it took GM more than a decade to recall 2.6 million vehicles with a defective part that lets the car sometimes shut off while being driven. Some of the GM documents show communication about investigations into why airbags were failing to deploy in some Cobalt accidents. Others show discussions about steering problems with some GM models. The documents also include memos from Delphi, the maker of the ignition switch, which we now know was flawed. "These initial documents revealed failures within the system," said House Energy and Commerce Committee Chairman Fred Upton in a prepared statement. The document dump comes less than two weeks after the committee heard testimony from Barra and David Friedman, the head of the government's auto safety agency. Officials are also looking closely at the way the safety agency, The National Highway Traffic and Safety Agency, oversaw GM's recall. One email dated July 24, 2013, indicates that at least one person at the agency thought GM was "slow to communicate" and "slow to act." A subsequent email from Mike Robinson, GM's vice president of sustainability and global regulatory affairs, says that he hopes the agency as a whole does not have that view. "We worked way too hard to earn a reputation as the best and we are not going to let that slide," Robinson wrote. NHTSA could not be immediately reached for comment. The House committee's investigation is ongoing. It is still receiving documents from GM (GM), a spokeswoman said.